It’s finally happened. We’ve waited and waited and waited, and then CBS made us wait another 30 hours. For some unknown reason, although the official version is that it was out of respect to the situation in Orlando, the planned Monday morning introduction of the new cast was postponed to Tuesday afternoon. Honestly, since I had another article due on Tuesday this worked out perfectly. So here are my initial thoughts on the cast of Big Brother 18! These opinions are based only on what has been provided so far. That includes a biographical questionnaires and video interviews on CBS.com, along with interviews to K-Frog radio in L.A. 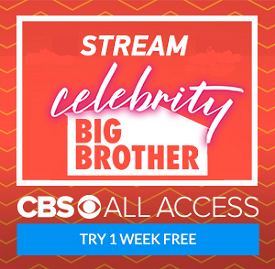 Unfortunately for us, the CBS interviews are pretty worthless, mainly because it’s former Big Brother contestant Jeff Schroeder hosting. He’s terrible. Why CBS has stuck with him all these years is beyond me. The network also denied access to bigbrothernetwork.com, who usually creates top-notch preseason chats. 1. 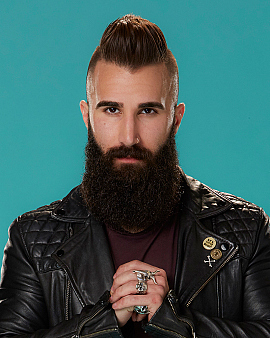 Paul Abrahamian: Abrahamian is a 23 year-old clothing designer from Tarzana, CA. The initial read from most people online is that he’s this year’s version of Big Brother 16’s Donny Thompson. Come on, the only similarity is that they both have giant beards. He looks more like a hipster, which seems to mesh with the fact his favorite activity is playing music. The problem is that which kind of hipster is he. Is he a Mumford and Sons fan, or does he like something more interesting? The K-Frog interview is pretty interesting, as he a loud and sometimes vulgar voice. He’s incredibly lively, so I expect some fireworks. 2. Victor Arroyo: This 25 year-old self-proclaimed “Latin lover” is a gym manager in Slidell, LA. He’s all about attracting women, and it’s also clear that he’s never watched the show. I hope he’s quickly out the door. 3. 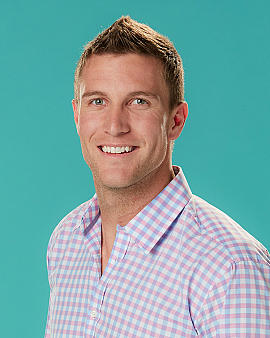 Corey Brooks: He’s a 25 year-old baseball coach from Dallas, TX, which is no surprise after taking one look at him. He’s definitely a jock type. He’s another one that’s clearly never seen the show until he was cast. (They all get videos of the last two season while in sequester.) After he was announced, the online sleuths discovered some five year-old tweets that are a bit troublesome, but that’s just silliness. Don’t get me wrong. I’m not a fan, and I know he was cast only due to his looks. He’ll probably last through most of the season. 4. 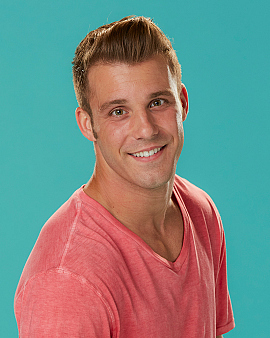 Paulie Calafiore: The first of a few stunt-casts of this season. 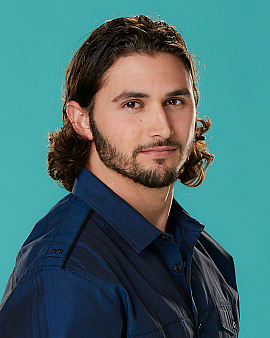 He’s a 27 year-old DJ (sure he is) from Howell, NJ, but more importantly he’s the older brother of Big Brother 16’s Cody Calafiore. Truthfully, this is not a great stunt-cast, as Cody was a dope. 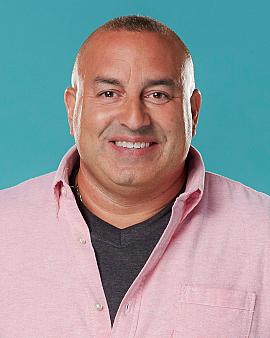 He was a bore on the live feeds, and made the dumbest move in Big Brother history when he took Derrick Levassur to the finals over Victoria Rafaelli. Paulie’s a dope. He’s bland. He’s tedious. I could go on and on. 5. Bronte D’Acquisto: Oh boy. She’s 26 year-old student from Denver...or so she says. It didn’t take long for people to find her ModelMayhem listing. She claims to be a math expert, but completely screwed up an easy math question in Jeff’s Interview. That’s not the worst part. Her voice is atrocious. I’m sorry, but she sounds like a high-pitched cartoon character. I have a feeling this is all an act, as she’s the only one so far that made any sense when talking about their strategy plans. If that’s the case, I may end up rooting for her. 6. Bridgette Dunning: The Ventura, CA travelling nurse is not really a superfan, but she has clearly studied multiple seasons in preparation. The 24 year-old is a true nerdy girl in the mold of last year’s Meg Maley, and like her she’s bound to make it a little bit past the halfway part. Especially since she can’t lie under any circumstances. 7. Zakiyah Everette: If this is what preschool teachers that are 24 look like in Charlotte, NC I need to adopt a kid quickly. I’m kidding. She’s pretty cute, but I bet she doesn’t take crap from anybody as she sounds like she’s straight from a show like “Basketball Wives”. This description is best exemplified by the fact she says she likes to suddenly twerk for no reason. She claims she’s “in to win it”, though, and would rather be hated winner than a beloved loser. 8. Jozea Flores: This L.A.-based 25 year-old celebrity make-up artist is an interesting character. 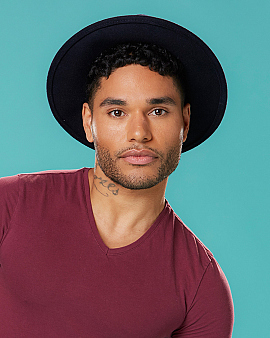 In his interviews and photos, he fits the mold of what CBS usually casts for their one and only gay houseguest. Yet he’s got a ton of modelling photos online where he’s a macho musclehead. What is the real Jozea? I believe it is the Big Brother version, especially when he says the thing he hates most is people “stealing his food”. Uh oh. It won’t take long for an argument or two. 9. Glenn Garcia: A big break from the previous eight, and also could be the most controversial. He’s 50, and the Bronx native is a former police detective who is now a dog groomer. He definitely fits the Bronx tough guy stereotype, which should create some fireworks in the house. This will especially be evident if the topic of politics comes up, as Garcia has a ton of tweets praising Trump. Personally, I don’t care about any cast members politics, but there are people online that already dislike him just for that reason. He’ll either go quickly, or last until the last couple of weeks. 10. Michelle Meyer: When I saw her interview with Schroeder I wasn’t impressed. This nutritionist from Washington Township, MI is actually a true superfan. She’s watched most of the previous seasons, and the only person to mention watching live feeds. 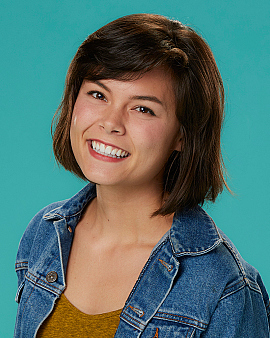 The 23 year-old looks sweet and wholesome, but her reddit comments about Big Brother are at times similar to my snarky posts. If she keeps her knowledge of the game in check, and just pushes her wholesome appearance, she could be a contender. 11. 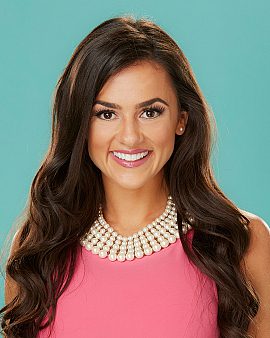 Natalie Negrotti: She’s another that didn’t apply to the show but was cast by Big Brother. She claims to be a event coordinator, but this 25 year-old was formerly a cheerleader for the New York Jets. She’s a bit in love with herself, and even uses the word “beautiful” as one of the descriptions of herself. 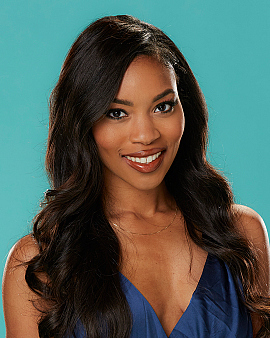 Producers cast her for one, and only one reason - to hopefully create a “showmance” with Corey Brooks. Like most of the model/cheerleader types of recent years Natalie will be out with in two or three weeks. 12. Tiffany Rousso: The second stuntcast of the season is the 32 year-old sister of last year contestant Vanessa Rousso. This fact is immediately evident as she’s the spitting image of her sister, and even more so when she started to talk. I had a few nightmarish shivers throughout the interview, as Vanessa was a high-strung maniac last year. A serious maniac. It was actually tiring to watch. But if Tiffany can act a bit more relaxed than her, I think she’ll do pretty well. So that’s it...so far. Although it's nice that there is actually a true adult in this year's casting, the vast majority are in their early 20's, and there is only on in their 30's. Also, did you notice that there are only twelve people listed above? That’s because there are at least four more people coming into the house. Various rumors have circulated the past few days, and the most credible story is that some housemates from previous seasons are coming in. Many names have been thrown around, but it’s pretty much agreed at this point that these will be Big Brother 17’s James Huling and Da’Vonne Rogers, Big Brother 16’s Nicole Franzel, and season 14’s Frank Eudy. This lineup initially points to a flashback to season 14’s “coaches” twist. That year, Britney Haynes, Dan Gheesling, Janelle Pierzina, and Mike “Boogie” Malin were brought back to head teams. If they made it to a certain point they were allowed to decide if they wanted to remain in the game as players. Obviously, they all said yes. Those four were true all-stars, though. This year’s foursome aren’t that formidable. They’re all nice people and very popular amongst a good portion of the fans, but outside of Eudy they weren’t very good players. Da’Vonne was actually voted out almost immediately! The theory currently floating around is that the theme of this season is “second chance”. This would explain the casting of Rousso and Calafiore as this would be a second chance for their family, while the four returnees are obviously being given a second chance to play. There may also be some other requirements for those four. Who knows if any of this is true? We’ll find out next Wednesday with the season premiere of “Big Brother”, along with the live feeds being turned on Thursday night. Strangely, the cast entered the house today (Thursday), which is something I’ve never understood. The show and feeds should start when they actually start the game, not a week later. Oh well, we’ve complained about that for years and years. To listen to not only my opinions but my friends Colette Lala and Indy Mike, check out the “Big Brother Gossip Show” this Saturday at 10 pm ET on Mixlr. We also have a Patreon site this year that offers some fun rewards for those who would like to donate to us. These rewards include a weekly extra show for those that donate a certain amount! What do you think is going to happen? Do you like this year's cast? Please let me know, even if have differing opinions. In fact, especially if you have differing opinions! At first he didn't but eventually agreed with the other four. Remember it was a case where all four had to agree. Ok I remembered it wrong. IMHO Boogie knew someone else would push the button so he didn't need to (so he could claim he didn't choose to enter the game). I think Boogie was happier being a coach because he didn't have to do anything besides the comps between the coaches.